Since 1837, a commitment to quality has characterised Fowler. This enduring feature has made Fowler bathroom products a firm favourite in Australian homes. Water conservation, stylish appearance, ease of installation and flexibility are just some of the factors that play a role in the development and appeal of Fowler products. Fowler uses vitreous china, which combines the design and appeal of the modern styles, with environmental and technological advances. Fowler acrylic and plastic products use the highest grade materials and the finest manufacturing processes to create products that are long-lasting and easy to care for. 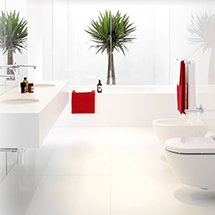 If you’re in the market for bathroom products – toilets to basins – you will find the latest trends, across all price-point, at Fowler.